These include day cleaning, night cleaning and a combination of the two. 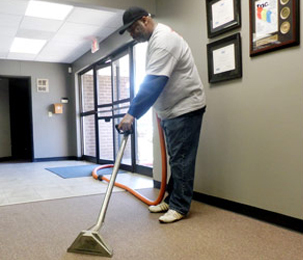 In addition to janitorial services, we offer various types of carpet cleaning and hard floor maintenance. We also specialize in green cleaning services to better the environment. We are always looking to expand our knowledge and expertise to grow in the commercial services we provide. Trust Us, It’s Clean. Nothing feels better than walking into a clean, refreshed space to start a new day. 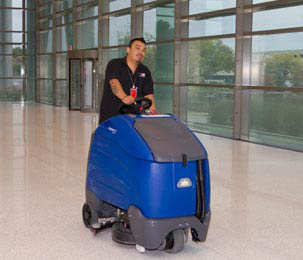 KB provides nightly janitorial services with dependable team members that consistently deliver quality services to meet your expectations. 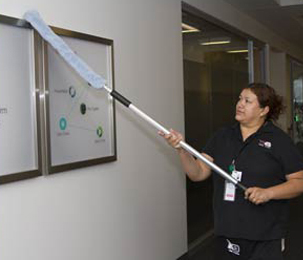 KB understands that the most important aspect of nightly janitorial service is trust and security. KB has mandatory processes in place, such as uniforms, ID badges and nightly checklists that help ensure a secured facility, as well as scheduled check-ins by the KB Office Team. 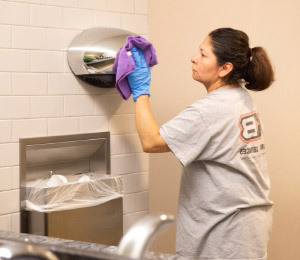 In high traffic facilities it is sometimes necessary to have a day maker present to ensure your facility is cleaned and stocked during regular business hours. KB day makers are trained and highly experienced in making your facility look well maintained all day. 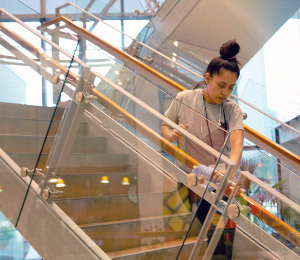 Utilizing a day maker in your facility also provides an on-site KB employee to assist with emergency needs that occur during the day. KB has a LEED Green Associate with concise training and continuous education to help you create a green workplace that is both environmentally friendly and socially responsible. In addition, KB was recently re-certified with the ISSA’s CIMS-GB with Honors certification, which ranks KB in the top 1% of 70,000 janitorial companies in the country. This certification reinforces that KB’s green cleaning practices are in alignment with the requirements from the U.S. Green Building Council (USGBC), LEED and the ISSA. 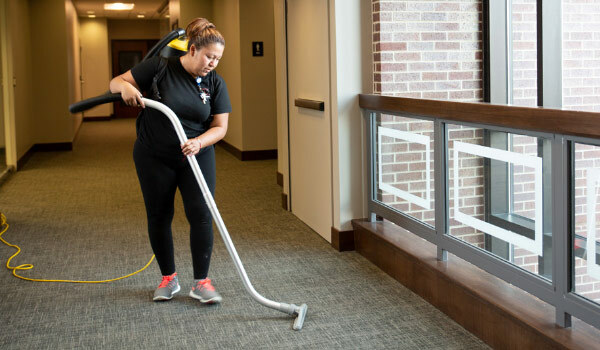 Whether you have coffee and soda stains, or your carpet is in need of a cleaning maintenance program, KB can provide carpet cleaning services to your facility. Full carpet cleaning consists of edge to edge carpet cleaning, including high traffic, individual offices, cubicle areas, etc.. Full carpet cleaning should be completed on an annual to bi-annual basis, depending on the usage of the space. Spot carpet cleaning consists of treating and extracting carpet stains from various spills and usage. Spot carpet cleaning should be completed as maintenance between your scheduled full carpet cleanings, or on an as-needed basis in regards to stains. KB offers truck mount carpet cleaning. The vacuum blower lifts the dirty water from the carpet. The high pressure water pump pumps heated water and chemical onto the carpet which is then extracted. Truck mount carpet cleaning is popular because of the power and flexibility it offers. KB offers portable carpet cleaning. 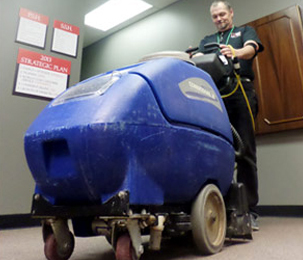 Portable machines provide carpet cleaning through heated water extraction. 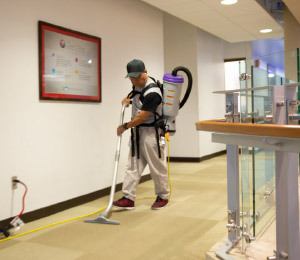 Portable carpet cleaning machines provide ease of use (no large amounts of hose running through a building or doors needing to be propped open) and offer maneuverability in order to access higher floors. Maintaining your hard surface flooring extends the life of the floor. The maintenance necessary depends on the type of flooring and the amount of foot traffic the floor encounters. 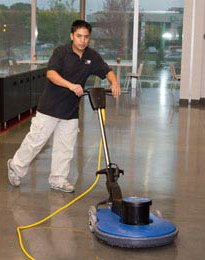 KB employs hard floor experts that can create a floor maintenance program specific to your needs. Stripping and waxing applies to Vinyl Composite Tile (VCT) and should be completed on either annual or every other year basis. For a strip and wax, all previous coats of wax are removed from the VCT flooring, the floor is scrubbed and then all new coats of wax are laid. The wax protects the flooring and also provides shine. Scrubbing and recoating applies to Vinyl Composite Tile (VCT) and is completed on the opposite rotation of a strip and wax. For a scrub & recoat, the top two layers of wax are removed from the VCT flooring, the floor is scrubbed and then two new coats of wax are laid. Burnishing applies to Vinyl Composite Tile (VCT) and is meant to bring back the shine and “new-ness” of the flooring. Burnishing re-ignites the top layer of wax and makes the floor “pop” in between the strip & wax and scrub & recoat floor services. Marble polishing applies to marble flooring and should be completed on an annual or bi-annual basis. Marble polishing buffs the marble and brings back the luster of the natural marble. Rotoscrubbing applies to all types of stone or ceramic tile. This type of tile is most common in restrooms and should be completed on a quarterly or bi-annual basis. Rotoscrubbing is the use of a low-speed floor machine with an intensifying chemical that allows a deep scrub of the tile and the grout. Sealing the grout applies to all types of stone or ceramic tile, or any tile that is grouted. Sealing the grout should be completed annually and in conjunction with a rotoscrub. Sealing the grout provides a barrier on the grout for potential stains, which in turn prevents discoloration in the grout. Whether building a new space from the ground up or renovating an old space, KB can clean up the mess and prepare the new space to be move in ready. Construction clean-ups are designed to occur post-construction and pre-move in. A KB team completes a full wipe down, top to bottom, ensuring all remaining construction dust and debris is fully removed. KB always recommends a construction clean-up because it is a great way to wipe the slate clean before employees move into the new space. This certification recognizes KB as in the top 1% of the 70,000+ janitorial companies in the country, and the only janitorial company in Nebraska with the certification.